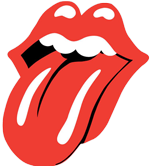 The Rolling Stones Use WordPress! - What WordPress Theme Is That? It’s true… WordPress started off as blogging platform, but over the years it has evolved into an exceptional content management system (CMS) with great versatility. It’s super easy to use/learn and flexible enough to do just about anything! Still have doubts? Check out this list of 40 Most Notable Big Brands That Are Using WordPress including; The Rolling Stones, The Dallas Mavericks & Fortune. How do I know? Add /wp-admin to the end of any url to find out. For example; The Maverick’s website is www.mavs.com. 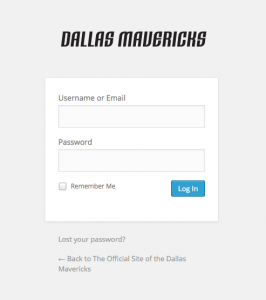 Type www.mavs.com/wp-admin and if you get a log-in screen that looks like the one to the left, then you know that site is running WordPress. Once you install the WordPress platform on your URL (you can search YouTube specifying your hosting company for countless DIY tutorials on how to do this) you install a theme onto the WordPress platform. There are over 10,000 different WP themes and twice as many free plug-ins for download creating virtually limitless options in both design as well as functionality. Think of the WordPress platform as a doll. There’s Barbie & Ken & Skipper (I know, I’m dating myself here…) and WordPress is Barbie. Once you’ve got your Barbie Doll, you start collecting outfits, only your WordPress theme is your favorite outfit that you never take off. You’ll find both free and paid themes. I, personally like paid themes better because the one time cost is very nominal (on average $20-50) and paid themes typically have more custom features as well as provide ongoing support and future updates / improvements. When you look at the bang for the buck, its a no-brainer. When I stumble across a site I like, the first thing I do is look to see if it’s a WordPress site by trying to access the log-in screen. If I really like the site design, I’ll then see if I can figure out which WordPress theme is being used. I use the 411 Pro Child Theme for Genesis. A child theme is accessories for the LBD. I hope this was this helpful? Please share any Ah-Ha’s or other tricks you’ve learned in the comments below.